For every object in your PRTG setup, you can not only name objects, you can also define tags in the object settings to additionally mark an object as a member of certain categories. Although some tags are automatically predefined when adding objects, you are completely free in which tags you want to add. For example, you can mark all of the bandwidth sensors that are especially important for you with the tag bandwidth_important. Later on, you can view lists of objects with certain tags (helpful for multi-edit of settings), or select sensors via tags when creating reports. A smart arrangement of tags can be a huge time saver. The keys enter, space, or comma confirm a tag. You can also change tags for several objects simultaneously using the multi-edit function. The tags in the settings of an object are automatically inherited by all other objects underneath in the Object Hierarchy. You can view inherited tags in section Parent Tags in the settings of a sensor, device, or group. So, for example, a device with the tag myExampleTag automatically passes on this tag to all sensors that you add to it. These sensors appear in lists whenever you search for myExampleTag. This is useful, for example, when you include sensors by tag in reports settings, because you do not have to tag every single sensor manually. Inheritance for tags cannot be disabled. You can use tags to filter table lists for specific objects, or to add sensors to Libraries and Reports. 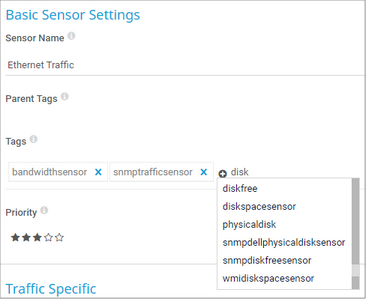 For example, you can restrict the sensors overview page to the sensors that have the tag bandwidth_important. You can also use more than one tag to filter for monitoring objects like sensors. The filter shows an object only if all three conditions are true. The order of the tags in a tag field does not matter. For example, if you enter –windows into a tag field, all sensors/devices that do not have "windows" as tag are shown. With +windows or windows you filter for objects that are tagged with "windows". You can use more than one logical operator in a tag field: For example, if you enter +netflow –bandwidth_important into a tag field, the corresponding list, library, or report includes all sensors that are tagged with "netflow" but not with the tag "bandwidth_important". If you enter netflow bandwidth_important, a sensor has to be tagged with "netflow" or "bandwidth_sensor" or both to be included. For performance reasons, PRTG has a display limit of 1000 tags when filtering By Tag under Sensors in the PRTG main menu. If you have more than 1000 tags, no tags are shown here. You can still use tags in this case, for example, for filtering and searching.